The Wall Street Journal has been dogging President Barack Obama's golf game. The president's political opponents are trying to say he is playing too much (compared to former President Bush). Glenn Beck is saying the president shouldn't play because we are at war. Get a life Glenn. One has nothing to do with the other. Our president NEEDS to get away from the pressures of the office on a peaceful golf course for a few hours. This love of the links can't be for keeps, they moan, for he who plays secretly must surely play badly. How badly? His score is a matter of "national security," deflects David Axelrod, political adviser to the First Duffer...but declined to comment further on why he appears to be favoring golf over hoops, or why members of the press haven't been allowed to watch him tee off. Postings by golf observers on the Web site Baller-in-Chief, which is primarily devoted to the president's basketball game, posit a brutal answer: Mr. Obama has a golf handicap in the mid-20s, considered weak to average, and a cramped swing that's not so pretty. And our fearless leader does not want to play on the Commander in Chief's 'home' courses near Washington. President Obama most often plays on one of two military courses, Fort Belvoir in Virginia and Andrews Air Force Base in Maryland. Although our leader has played at Andrews Air Force Base many times, and feels that he could 'take the president' there, he wants to take the president to Langston Golf Course in the heart of our nation's capital. The challenge has been sent President Obama. Although our fearless leader's handicap is around the north end of 20 too, he feels, from seeing the president's golf swing on television, that he can take him. And President Obama is a south paw. A lefty. 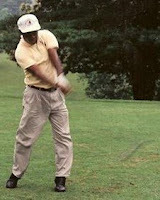 Just look at the smooth swing of our leader, upper left, and the strained swing of President Obama, upper right. Note the AAEA president's straight lead arm and the bent lead arm of President Obama. The lead arm should be straight.